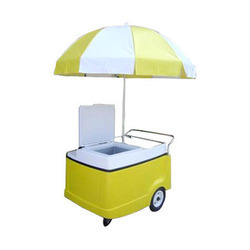 Manufacturer of a wide range of products which include ice cream cart. We are successfully ranked amongst the top manufacturers of Ice Cream Push Cart that is widely used in retail outlets across the country. Our offered range is manufactured using quality raw material sourced from well established vendors of the market. Constructed of fiberglass, stainless steel, and aluminum. Additional storage inside the cart, with lock door. Looking for Ice Cream Push Cart ?